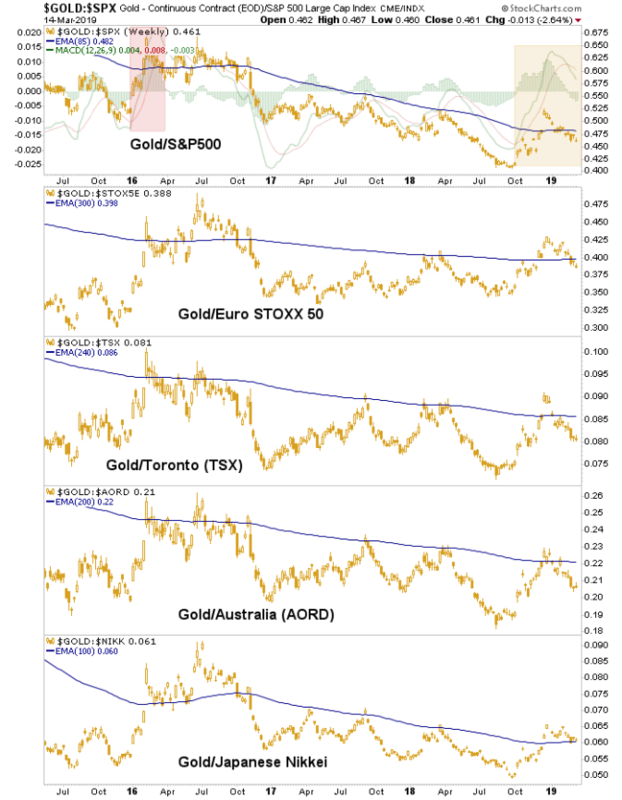 But while the HUI/Gold ratio has been a distinctly positive technical indicator and many bullish gold stock charts populated the sector, we had noted back in December that gold’s hysterically overbought performance vs. broad stocks was due to pull back, hopefully in an orderly consolidation. Well, the relief has dragged on and the ratio of gold to SPX and its global fellows has been consolidating alright. …with respect to this chart. What I did not like was the similarity between the unsustainable launch in 2016’s weekly MACD to today’s situation. Now Au/SPX has crossed weekly MACD down without the launch ever having put a dent in the long-term downtrend. This is another issue. I want gold, silver and especially the miners to launch as much as the next goldbug lunatic, but what I want more than that is to be in line with what is happening. And since December’s blow off in anxiety what has been happening is relief and risk ‘on’ markets out-performing gold. Some will make excuses about evil cabals of financial elites working in concert with globally coordinated Central Banks to quash poor gold and its message that something is not right with the system. Well, I happen to agree with that second part or else, why be a gold bug in the first place? It’s a miserable way to live while the Good Ship Lollypop (AKA the US stock market, especially) sails on. But it’s best to be a smart bug and that means playing by the rules of those much larger creatures walking around above you in shiny and expensive dress shoes. Rule #1 is DO NOT GET SQUASHED! We are in this for the long run, baby. The tried and true gold cheerleader indicator as linked in paragraph 1. The stalled and down triggered weekly MACD on the chart above after a heavily overbought condition registered in and around the Christmas Eve massacre in stocks. Look, I started becoming constructive on the sector when crickets were the only bugs to be heard. But the markets change as new information comes in. I’ll likely continue to be constructive on the sector but I’ll do so realizing that there are some pretty big shoes currently stomping around on the macro floor and that patience and associated risk management are virtues. We’ll just have to stick with simple themes like the pictures within the Macrocosm to guide the process. We got some good signals toward economic contraction and declining confidence in Q4 2018 but then Central Banks performed a coordinated about face to at least promote a dovish pretense. Somewhat ironically, that has come with a halt to gold’s out performance and despite a raft of bad US and global data the markets do not seem to believe the economic contraction theme at this point. Other aspects of the Macrocosm never did change trend as the trends in the yield curve, gold/stocks and even confidence remain intact. Be a patient bug and let processes play out over time. I am going to take incoming information and process it weekly. I’d love nothing more than to get bullish again. But we never did get certifiably longer-term bullish because we never did turn the trends and hence, the macro. For months the HUI target was a thick resistance zone at 170 to 180, prior to it finally being registered. That was when the cheering became too intense. For now, the macro fundamental and technical is a mixed bag. 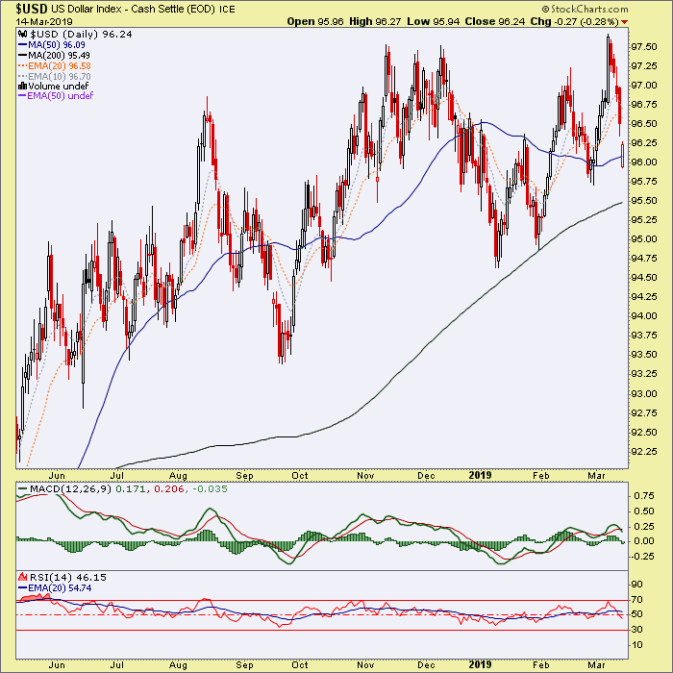 I am not abandoning a forward bullish view, but that gold/stock markets chart needs to stabilize and other macro/sector fundamentals along with sentiment need to come in line. And the next time the bullhorns sound across Goldbugville maybe one or two more bugs will tune them out. It really is a reliable short-term indicator all on its own. Thing 1: The best backdrop for gold mining is as the Macrocosm above implies, a disinflationary and/or economically stressed backdrop as gold, with its relatively counter-cyclical characteristics out-performs most everything but possibly the reserve currency. Thing 2: USD is still in an uptrend, weeks after its death was pronounced, having ticked a new high in the meantime. As of this writing on Friday morning gold and silver futures are positive and USD is down. Stock markets are in the green and threatening a key resistance area. If gold, silver and especially the miners are still being touted as part of the greater anti-USD trades because ‘inflation is coming!’ at best the miners will be also-rans, fundamentally. Now, gold stocks have made massive gains during phases where their fundamentals eroded (a long phase in 2004-2008 and a micro phase in Q2 2016) and we have several analytical angles showing them as currently very under valued. But the best fundamentals appear when things fall apart, not when everyone is banking coin during a cyclical ‘inflation trade’. I’d say to watch the US dollar first and foremost. A breakdown could launch an ‘inflation trade’. A hold of current trends, the opposite. 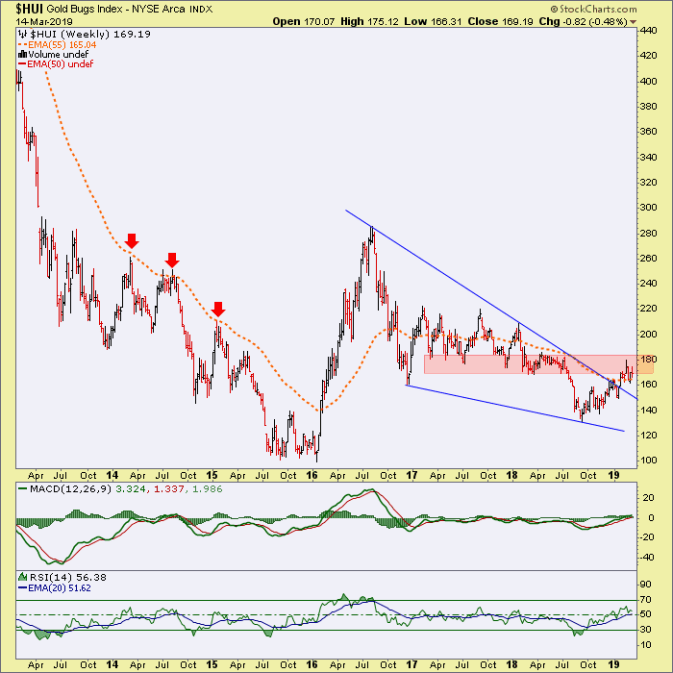 I am not suggesting that a rally in USD would be short-term bullish for gold and the miners (it likely would not be), but I am suggesting that a rally in USD would be consistent with the gold sector’s best fundamental backdrop. It is possible that the mini-bear in equities in Q4 2018 was the gold sector launch amid peak fundamentals. But if so, with subsequently and almost immediately bulling stock markets and no recession (yet), it would not have been comparable in the least to the the bear markets and recessions in the 2001 and 2008 time frames.